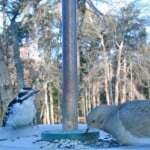 It is Thanksgiving morning and as I drink my coffee I watch the birds crowd into the feeder. 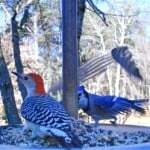 Cardinals, morning doves and a titmouse take turns with the blue jays. We have lots of blue jays. Just below the birdfeeder, four crows walk up the grass path from the lake, looking like religious elders in their dark dress and deliberate gait. We have had this feeder up since we bought Poison Ivy Acres a year ago, and I think that the former owners must have had one in this same location. The birds came from day one. 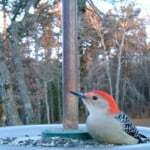 We especially enjoy seeing them at the feeder as we have breakfast in the morning. Lately we’ve been taking pleasure in this feeder in a whole new way. We’ve mounted a Birdcam to the pole, and this motion-activated camera takes photos of all who visit the feeder. 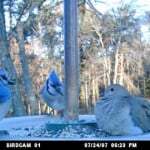 Put the card into the camera when you fill the feeder in the morning and you have, well, a bird’s eye view on the action for the rest of the day. 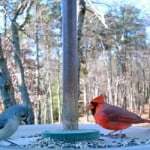 We’ve not only gotten close-ups of all the birds who feed there, but the camera often catches their personalities and frequently gets shots of birds in motion. Great fun. Downloading the day’s photo-shoot, we comb through looking for the best pictures at the end of the day. The card holds several hundred depending on what size photos you set the camera to take. 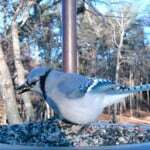 Going from shot to shot as we pick out the best ones, we see just how much of our birdseed is going to the jays. The numbers of blue jays seems to increase daily. Eight one day, ten the next, a dozen this morning. They fill photo after photo that the Birdcam snaps. I remember that my father-in-law used to dislike the jays. Aggressive, pushy birds. Common. As bird-lovers, and gardeners, we always want to see the exotic and rare. When the bluebirds come through in the spring and fall we rejoice. But daily, when we see large, beautiful, blue birds that are streaked with white and black, we no longer notice how splendid they are. They are too common. This Thanksgiving day I vow to cherish the ordinary plants and birds…the marigolds and the bluejays. I want to remember to see the commonplace with new eyes.